The ground floor provides a delightful living, dining and kitchen area and the first floor provides an open plan bedroom and en suite shower room. A two seater sofa and two arm chairs grace the living area with very comfortable lounging for all of the visitors. A television with freeview box and dvd player is provided. The kitchen is a fully equipped and fitted modern kitchen with gas hob, electric oven, washer-drier, dishwasher, fridge and ample storage cupboards. The cutlery, crockery and cooking utensils are of a good standard (e.g thick bottomed pans) and are complete matching sets. 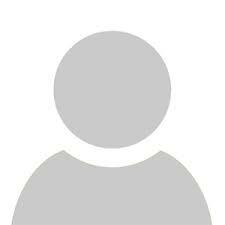 The kitchen is fully equipped to include such items as garlic crushers and salad spinners. 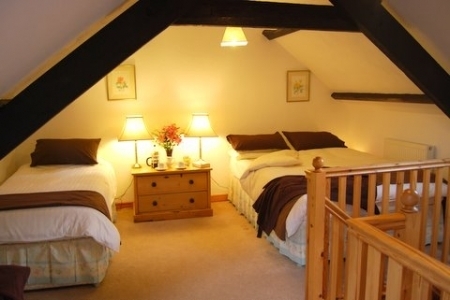 The bedroom has a double bed and a single bed so is also suitable for two friends to use. It has two bedside tables, a chest of drawers, a fitted wardrobe and a three quarters length mirror hung on the wall. 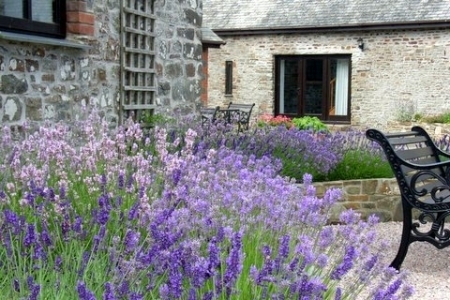 The ground floor has two original oak beams running from front to back that create a lovely atmosphere to the cottage. The bedroom has two large window lights that give the feel of sleeping under the stars on a clear night. Japonica looks out into a small courtyard area which is shared with Hydrangea. The area is gravelled and bounded by a low stone wall. In the courtyard is two cast iron tables and chairs for the occupants of Japonica and Hydrangea. The inner courtyard looks out to a central stone circle within the larger courtyard formed by the cottages and the rear of Downe House. Within the stone circle is a fountain and it is particularly pleasant to sit out listening to the cascade of water in the late afternoon and early evening. Ideal for romantic breaks, short breaks and weekend breaks. The perfect holiday cottage. 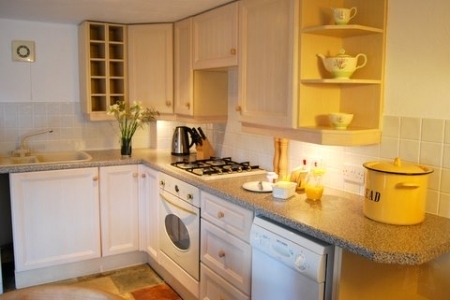 A self catering cottage at its very best. 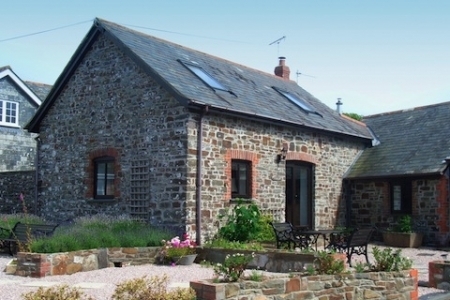 A holiday cottage in heaven on the Hartland Peninsula in North Devon.